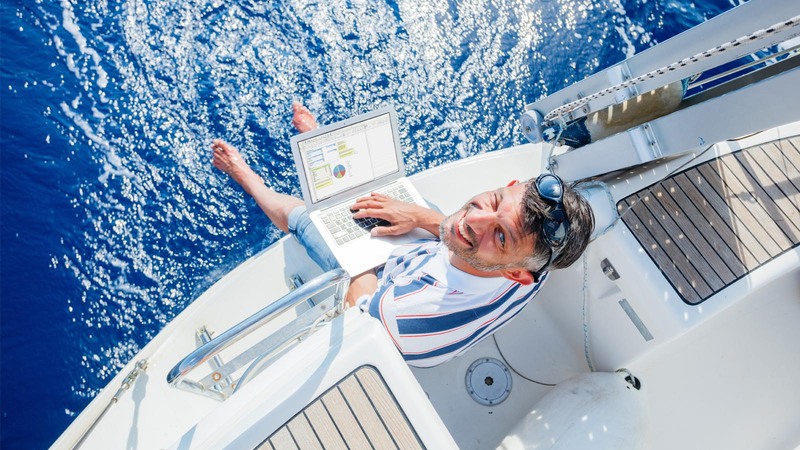 Using electric power at sea differs from using it at home. On board battery system is the main source of electricity on a boat. When moored in a marina, sailors can connect to the shore power system to get AC 220/240 V. When connected to the shore power, you can charge your devices via 220/240 V electric outlet. Electric generator, although noisy and diesel-hungry, can provide you with the same power (220/240 V) during sailing or when anchored without a shore power connection. Modern generators, though, tend to reduce the amount of noise, which makes staying at the anchor or tied to buoy much more pleasant. In case your boat is not equipped with a generator or a converter from 12 V to 220/240 V, you will be using a 12 V ‘car lighter’ sockets. A 12 V ‘car lighter’ adapter can be used to charge mobile phones, tablets and laptops. Prepare yourself and buy 12 V socket adapters which will convert it into one or two USB sockets, and you will be able to charge almost any device. Have in mind that this is a rather slow way of charging devices. Make sure to bring solar chargers and power banks as well. The voltage on the boat should be between 11.5 and 14 V; in case the number drops below 11.5, there will not be enough power to start the boat’s engine, so make sure to regularly check the voltage. You can save some electric power by reducing the fridge temperature or by turning it off for a few hours during the night. Also, do not let the lights in cabins and saloon constantly turned on and you will save even more electric energy. When the boat is underway using the engine, electricity will also be produced from this source. Use that time while the engine is turned on and charge as many devices as possible. Once the engine is turned off, one should be careful about using onboard battery system. Having a boat equipped with solar panels is another way of acquiring electricity for using electric appliances. The amount of energy acquired depends on the solar panels surface, but in most cases, you will be able to acquire enough electric power to power all electric devices and navigational instruments on a boat. With these few tips you will save enough electric energy and have pleasant sailing holidays.